Rhythm Magazine’s 4 star review of How to Teach Drums (Dec 2013 Issue), recommends anyone seriously thinking of getting into teaching to get a copy of the book and keep in it within reach. I can’t tell you how pleased I am. Firstly, it’s great to feature in the pages of a magazine I’ve been reading since I was a kid, but most excitingly because respected drum teacher Colin Woolway (Founder of “Drumsense“) basically says that I’ve achieved exactly what I hoped to do when I started writing the book! 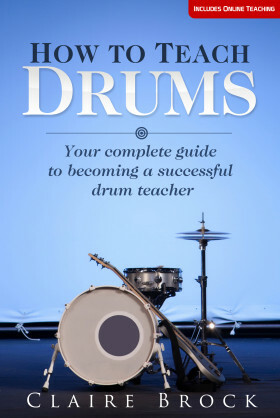 “Claire Brock’s useful guide for drum tutors contains some really valuable advice and embraces not only lesson planning but contemporary aspects of teaching such as Skype teaching, website building and YouTube videos. Thanks to Rhythm and Colin.